The Anglo-Saxon cemetery at Collingbourne Ducis is one of the largest cemeteries in Wiltshire. Dating to between the 5th and 7th centuries AD, it was investigated in 1974 and, in 2007, by Wessex Archaeology. In all over 120 burials have been found. The analysis of the skeletons and the finds and environmental evidence is about to begin so the results presented here are a preliminary summary of the cemetery and an overview of its regional context. The most spectacular discovery was a rare bed burial (Grave 1468 containing an adult female, aged 45+ years) of which numerous iron fittings have survived. Dated to the 7th century, and probably the the second half of it, bed burials are usually found with adult females. Finds are concentrated in Wessex and an area east of Cambridge. These beds are typically found in high status burials, often under barrows, and are usually accompanied by jewellery and several types of vessels, both metal and pottery. It is therefore intriguing that the Collingbourne Ducis burial was only accompanied by a pot. The first excavations in 1974 recovered only inhumations. This largely agrees with the evidence from the other Wiltshire cemeteries. However, in 2007, 13 cremation burials were excavated. It is debatable whether Collingbourne Ducis can be described as a true mixed-rite cemetery. As at the nearby cemetery of Pewsey, cremation is really only a minority practice. In Hampshire and the Upper Thames Valley cremation and inhumation burials are present in roughly equal numbers so the small number of cremation burials in Wiltshire is notable. The predominance of inhumation over cremation in Wiltshire is interesting especially because cremation continued throughout the 6th century in the surrounding areas. Perhaps this was one way in which the Wiltshire Saxons signalled their difference from the other groups in Wessex. The close proximity of native British areas to the West should not be overlooked as their burial practices may have influenced those in Wiltshire. The table below shows a number of well-excavated cemeteries in south Wiltshire that provide the regional background against which the Collingbourne Ducis cemetery can be assessed. The grave goods are fairly typical of Anglo-Saxon cemeteries in Wessex. A range of weapon types is present and the jewellery is predominantly Saxon in character. The humble knife is the most common object, closely followed by the buckle. Many buckles are simple iron loops, but an exception is the rare iron kidney-shaped buckle with rectangular cellwork plate. It is significant that two of the other three known examples (from graves) come from Wiltshire (Petersfinger and Pewsey). Does this indicate an origin for this type in the county? Twelve weapon burials have been found. There are no particularly elaborate assemblages. In contrast to both Petersfinger and Pewsey no sword/shield/spear combinations were found. If burial wealth is a measure of social complexity, then the evidence might suggest that Collingbourne Ducis' male population was ranked more evenly. Most of the weapon types can be paralleled locally, e.g. the leaf-shaped and angular concave-sided spearheads, although there are other types that are much rare in the county. The same applies to the shield bosses. Overall 24 inhumations contained jewellery, mainly brooches, and the range is again typical for southern England, especially the Saxon area. Pair of saucer brooches from Grave 1348. Click to enlarge. A relatively large number of small long-brooches (n=8) were found in 2007. Usually considered an Anglian type, they have recently been found in greater numbers south of the Thames. An up-to-date study might reveal the presence of sub-groups that are regionally diagnostic, and it is notable that most Collingbourne examples are best paralleled in other Wiltshire cemeteries. Other rare brooch types include a pair of unusual bow or equal-armed brooches and a small group of penannular brooches. An important discovery was a rare gilded ‘face brooch' decorated in Style 1 animal art. No exact parallels have so far been found, although a pair of roughly similar brooches was found in the Upper Thames Valley in Grave 136 at Lechlade, Gloucestershire. A 'keystone' disc brooch of the earlier 7th century, decorated with red garnet and Style 1 animal art, represents Kentish influence. Overall the material culture reflects the Saxon identity of this community. Most of the metalwork can be paralleled in other Wiltshire sites, although certain brooches and weapon types demonstrate links with surrounding Saxon areas, especially the Upper Thames Valley. The relative rarity of Anglian and Kentish material indicates that this was a community had only limited long distance connections. The cemetery was used from the later 5th to the 7th centuries AD. Among the early finds, found in 1974, is a pair of applied disc brooches with human mask motifs (from Grave 23) and an equal-arm brooch (Grave 6). The iron kidney-shaped buckle (Grave 1157) and a copper alloy kidney-shaped loop (G1rave 150) were also probably produced in the later fifth century but may not have been buried until the late 5th or early 6th century. The majority of the burials with grave goods date to the 6th century. Several burials produced definitive evidence for the 7th century, among them the bed burial (Grave 1468) and a burial with a monochrome ‘doughnut' type bead, small copper alloy buckle and pin (Grave 1434). It seems that, as Heinrich Härke suggested, Collingbourne Ducis is an example of a ‘monocentric' cemetery. That is to say burials radiated out from an early 'core', resulting in the establishment of several ‘satellite' clusters, each being used during the later 5th and 6th centuries. At Collingbourne Ducis the early core is in the western part of the excavation area. Cremation burials are found throughout the excavation area, although a group was located close to the four post structure. The area around them lacks inhumations and this may have been an area set aside for this rite in a manner similar to the way the two rites were organised at Portway East, Andover. Collingbourne Ducis: plan of cemetery. The latest burials are situated on the eastern extremity of the burial ground. Interestingly, they are separated from the main part of the cemetery by a coombe (a small valley). Should these burials be thought of as a separate cemetery? Is there a spatial separation similar to that recognised elsewhere, for example at Sheffield's Hill (Lincolnshire)? Perhaps the changes in burial practice (and also ideology) that took place during the later 6th and 7th centuries required a new resting place for the dead. The coombe would have marked out the separateness of the new cemetery. It is significant that cremation burials are found in both areas, suggesting that this rite outlived the 6th century. Although evidence for this is rare, parallels for ‘late' cremation burial can be found at St Mary's Stadium (Southampton) and Apple Down. It is currently planned to publish the results of the excavations at Collingbourne Ducis as a Archaeology monograph. The excavation, analysis and publication are all funded by Sarsen Housing Association. The significance of this is not yet known, but the use of two main alignments is a feature that the burial ground shares with the cemetery at Petersfinger (near Salisbury) where alignment seems to have been used to distinguish two separate households that buried their dead in the same cemetery. As in most early Anglo-Saxon cemeteries, the vast majority of the interments from 2007 had been laid out extended supine, although several less frequent positions are also present, such as burial on the side (n=6) and crouched (n=3). The latter is quite interesting because three examples were also found in 1974, and as a group they are characterised by a relative lack of objects buried with them. In fact, Wiltshire does seem to have a relatively large number of these interments. This minority practice was probably a way to distinguish individuals of a special status, though we should not dismiss the idea that it was a native rite that had been adopted, especially given the relative closeness of Western ‘British' Wessex. There was a lack of internal grave structures but several were embellished with a flint lining, while in another a burnt log was placed along one side of the grave. Two of the cremation burials were enclosed by an external structure that would have signalled the location of the grave and in one case is very similar to the four-post structures known from Alton (Hampshire) and Apple Down (West Sussex), while the other is similar to the annular ditches at Portway East, Andover (Hampshire). Akerman, J.Y. (1855a) An account of excavations in an Anglo-Saxon burial ground at Harnham Hill, near Salisbury. Archaeologia, 35: 259-278. Akerman, J.Y. (1855b) Note on some further discoveries in the Anglo-Saxon burial ground at Harnham Hill, near Salisbury. Archaeologia, 35: 475-479. Cook, A.M. and Dacre, M. (1985) Excavations at Portway, Andover, 1973-1975. University Committee for Archaeology Monograph, 4. Oxford, University Committee for Archaeology Monograph. Birbeck, V. with Smith, R.J.C., Andrews, P. and Stoodley, N. (2005) The Origins of Mid-Saxon Southampton: Excavations at the Friends Provident St Mary’s Stadium 1998-2000. Wessex Archaeology Report 20. Salisbury, Wessex Archaeology. Boyle, A., Jennings, D., Miles, D. and Palmer, S. (1998) The Anglo-Saxon Cemetery at Butler’s Field, Lechlade, Gloucestershire. Thames Valley Landscape Monographs, 10. London, Thames Valley Landscape Monographs. Davies, S.M. (1985) The excavation of an Anglo-Saxon cemetery (and some prehistoric pits) at Charlton Plantation, near Downton. Wiltshire Archaeology and Natural History Magazine, 79 (1984): 109-154. Down, A. and Welch, M. (1990) Chichester Excavations 7: Apple Down and the Mardens. Chichester, Phillmore. Eagles, B. (forthcoming) The Anglo-Saxon Cemetery at Blacknall Field, Pewsey, Wiltshire, London, English Heritage. 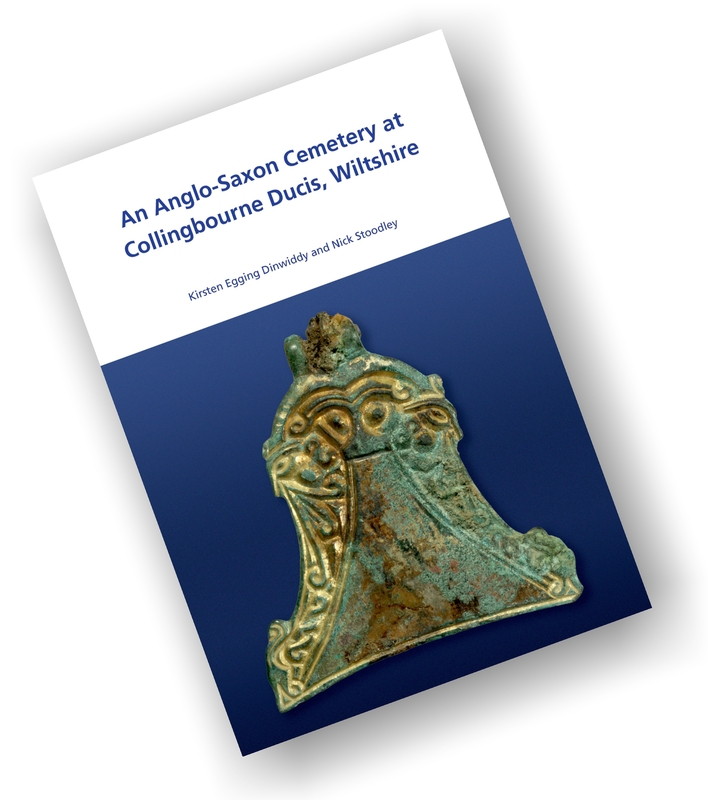 Egging Dinwiddy, K. and Stoodley, N. (2016) An Anglo-Saxon Cemetery at Collingbourne Ducis, Wiltshire, Wessex Archaeology Monograph 37. Evison, V.I. (1988) The Anglo-Saxon Cemetery at Alton, Winchester, Hampshire Field Club and Archaeology Society Monograph 4. Gingell, C.J. (1978) The excavation of an early Anglo-Saxon cemetery at Collingbourne Ducis, Wilts, Wiltshire Archaeology and Natural History Magazine, 70/71 (1975-76), 61-98. Härke, H. (1997) Early Anglo-Saxon Social Structure, Hines, J. (ed.) The Anglo-Saxons: Towards an Ethnography, Woodbridge, 125-170. Leeds, E. T. and Shortt, H. de S. (1953) An Anglo-Saxon cemetery at Petersfinger, near Salisbury, Wilts. Salisbury. Musty, J. and Stratton, J.E.D. (1964) A Saxon cemetery at Winterbourne Gunner, near Salisbury, Wiltshire Archaeology and Natural History Magazine 59, 86-109. Pine, J. (2001) The excavation of a Saxon settlement at Cadley Road, Collingbourne Ducis, Wiltshire, Wiltshire Archaeology and Natural History Magazine 94, 88–117. Williams, P. and Newman, R. (2006) Market Lavington, Wiltshire: an Anglo-Saxon cemetery and settlement, Wessex Archaeology Report 19. Salisbury, Wessex Archaeology.